simply avoid unfair practices, bid riggin (collusion), or other violations of applicable laws. In fact, public procurement is expected to be a strategic policy instrument towards achieving a sustainable society. ▪ What is SPP? Why is it necessary? ▪ How has SPP been promoted in the procurement processes within the international community? ▪ How much has SPP been implemented in Erope and the United States? ▪ What is the current state of SPP in Japan? 1. 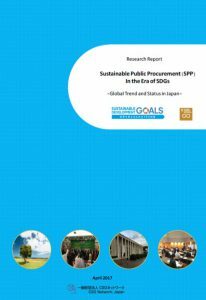 What is Sustainable Public Procurement? 5.3 Towards the Future: What Can Be Done to Promote SPP?